The UK Labour Party will ban fracking in case it wins the snap general election in June. 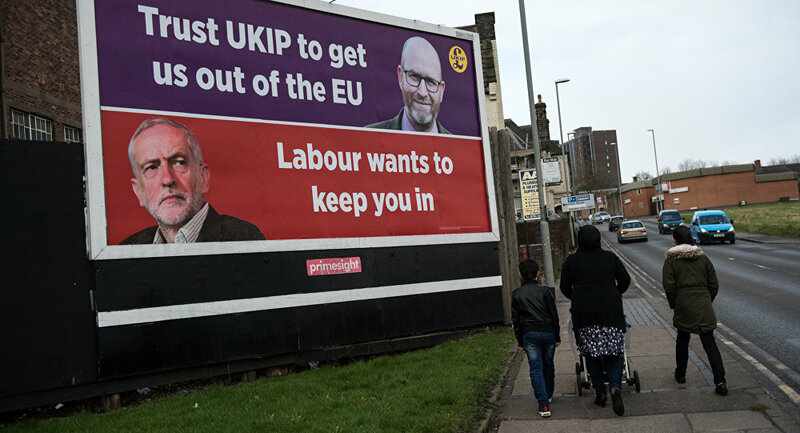 MOSCOW (Sputnik) — The UK Labour Party, should it wins the snap general election in June, will ban fracking, the party's manifesto, launched Tuesday, said. "Labour will ban fracking because it would lock us into an energy infrastructure based on fossil fuels, long after the point in 2030 when the Committee on Climate Change says gas in the UK must sharply decline," the manifesto unveiled by Labour's leader Jeremy Corbyn read. According to the manifesto, the emerging technologies would smooth the transition to cleaner fuels. "We are committed to renewable energy projects, including tidal lagoons, which can help create manufacturing and energy jobs as well as contributing to climate-change commitments," the paper said. People across the United Kingdom has long been protesting against fracking activities, in particular in Lancashire region. Hydraulic fracturing or fracking is a technology that allows extracting shale hydrocarbons by injecting pressurized toxic liquid into the ground. Fracking has been largely criticized by its opponents for the risks posed to environment and people's health, as well as for the tremors caused by the technology. On April 18, UK Prime Minister Theresa May announced her decision to hold an early parliamentary election on June 8 to overcome divisions in the parliament and succeed in the negotiations with the European Union on Brexit. According to recent polls, the ruling Conservative party is projected to win general election with 48 percent, while the Labour is set to receive 28 percent of votes.